An RSS feed (or news feed) is a means by which you can stay informed about what's going on at Dunedin Harmony Chorus without having to regularly visit the website. 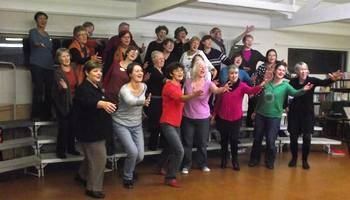 Love to sing: welcome to the Dunedin Harmony Chorus? Do you love to sing? Do you want a musical escape where you can make friends with other diverse, dynamic women? We sing a cappella (unaccompanied) four-part harmony in the barbershop style. Our repertoire includes modern, upbeat, inspirational and ballad-style songs. We not only sing, but we move to the music with showmanship being an important part of telling the story and showing the sentiment of the song. Our members enjoy our Tuesday evening rehearsals because they are all about music, fun and achievement. Come and join us. You may find it will change your life. We meet at 7.30 each Tuesday evening at the Andersons Bay Bowling Club, 31 Bayfield Road, Dunedin - you will be most welcome. Our musical team, headed by director, Robyn Abernethy, continually provides vocal education to help develop our best voice and improve our sound. We also have both national and international vocal and visual coaches visit Dunedin Harmony Chorus on a regular basis. It is a wonderful hobby where you not only get vocal training, musical education and the chance to perform, but you make great life-long friends, have a ton of fun and have the opportunity to compete with other Sweet Adeline International members. Want Dunedin Harmony Chorus to sing at your next function? Why not hire Dunedin Harmony Chorus to entertain at your next event? We can perform at corporate functions, charity events, community Entertainment events, birthday parties, christmas parties, awards nights, weddings, engagements, anniversaries, engagements, and even funerals and memorial services.